Azure Striker Gunvolt 2 is the sequel to Azure Striker Gunvolt, from Inti Creates, the studio behind behind a number of latter day entries in the Mega Man series, as well as Mighty No. 9. The hero of the original game, Gunvolt, makes a return, using his electrical abilities to defeat enemies directly and chaining together arcs of electricity to wipe out groups of foes. 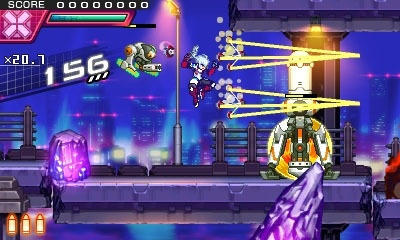 A new playable character is introduced in the form of Copen, Gunvolt's rival, with entirely different gameplay, focusing on dashing quickly around the environment and unleashing barrages of homing missiles. Also borrowing from Mega Man, Copen can copy boss abilities and turn them against his enemies. The game is headed to the 3DS via the Nintendo eShop and a physical release - which also contains the original game - on September 30. For more details about the Gunvolt universe, check our coverage of the original game here.